With Halloween just around the corner, one Indiana family is starting to feel like they're living in a haunted house after discovering bones, embalming tools and gruesome photos of the dead in their attic. "I won't stay by myself," Patricia Booher told The Huffington Post. "I have an uneasy feeling. I don't know what it is. I've tried to stay here but I can't." Booher and her husband, Richard, recently moved into their home in Knightstown, a small town about 40 miles east of Indianapolis. On Monday, they were looking in the attic of for a place to store their air conditioner when they made the first of a series of bizarre discoveries. "There were boxes of stuff in there. We thought it was knickknacks or some old dishes someone had left," Booher said. "When [Richard] started pulling the stuff out, we found a box of empty disinfectant bottles and a wooden crate full of bottles of embalming fluid. Then he pulled out a suitcase that was full of embalming equipment -- hoses and stuff." The more the family looked through the boxes, the creepier their finds became. "There were knives in a case that folded out, scalpels, scissors and things they work on people with," Booher continued. "Then we found pictures of dead people -- before and after pictures of them being worked on, a projector with similar films and a skeleton." The skeleton and the collection of morbid items concerned the family enough that they contacted the Knightstown Police Department. Officers took photos of the items and examined the bones. "The skeleton was determined to be a model -- like you would see on display in a doctor's office or a school classroom," Knightstown Police officer Anthony Lorton told The Huffington Post. While police examined the other items, Booher and her family got curious and began digging around in their basement and backyard. 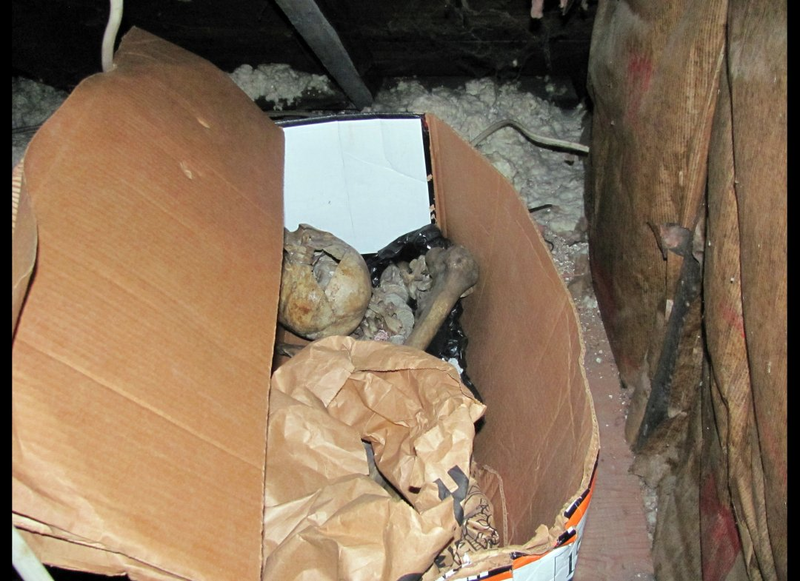 "My daughter, son and niece found a few bones in the basement. Then we found four more pieces: a hip joint, vertebra, index finger bone and a rib bone," Booher said. So far, the findings have been frightening -- but they haven't aroused suspicions of foul play, according to police. 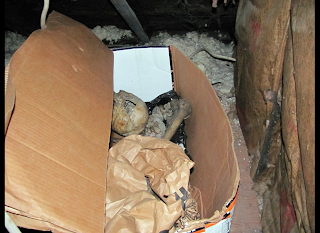 "The bones found in the cellar have been ruled out as animal bones," Lorton said. "We took the others to [the anthropology department at] Ball State University to be tested to see what they are. That will be done Friday." Booher said family members are continuing to dig in the backyard today. "I'm not saying the person who put this stuff here was a bad man. I just want to know why it was left here. Why are there bones here? You have to honor the dead," Booher said. 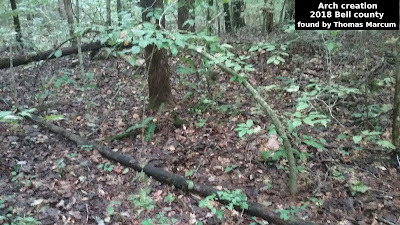 Whether the most recent bones are human is yet to be seen, but Lorton said he thinks he may have some explanation for the scary discoveries. "The story we are getting is that there was a gentleman who was renting to own the property and up and left it, along with a lot of his stuff at the house," he said. "So that is probably where all that stuff came from." The photos of dead people appear to be from the 1970s and 1980s, the officer said, and were likely taken by the person who performed their embalming. "Look at them from the standpoint of an individual who is keeping a portfolio of his work," Lorton said. "To the everyday person, they are going to be disturbing to look at, but for a person trying to get a job at a funeral home, they are examples of his work." Lorton added, "Is it creepy? Yes. Criminal? No." As for the skeleton, the officer said he may have his own plans for it if the Boohers do not want it back. "I am half tempted to put a hat on it and have it running radar," Lorton joked. TCH - Here is what really gets me...the Police are acting like it's a normal thing for someone to work at a funeral home and bury people in their basement and tuck them away in an attic. At the very least it is abuse of a corpse and would be totally unethical. And then to joke about it. If them are real bones then they are someones loved one. This story is sad,spooky and unreal all at once.